February through April is the hot, dry and miserable season in Southeast Asia. As luck would have it, on the day we planned a 400 km journey by motorcycle from Mandalay southward to the town of Yanguan, it was rainy, cold and miserable. We also left all of our wet weather gear in Bangkok, so the bulk of the journey was conducted in layers of moist, thin cotton clothes and accompanied by chattering teeth. Google maps said it would take 3.5 hours going 60 km/hour. I generously estimated that we would make it in about 5 or 6, but fate intervened in the form of a dubiously attired highway policeman wearing flip flops. You see, the route that Google caululated assumed that we were in a car and not on at 125 cc motorcycle. As we sped by an unassuming interchange, two cops began chase and motioned for us to pull over. Unable to speak any English and with me about to throw a serious fit to avoid what I thought was going to be some sort of tourist extortion stunt, they signaled for us to follow them to the police station. 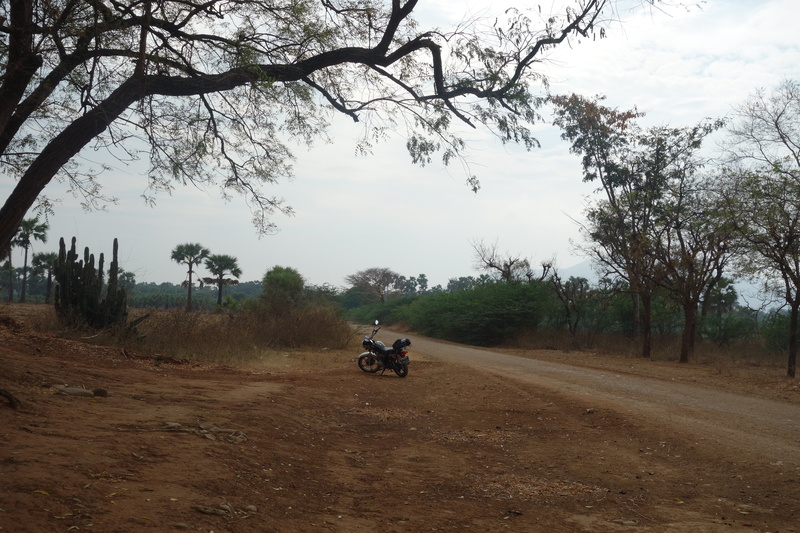 Just a few hundred meters up the road, the dubiously clad head highway patrol officer sitting on a rickety stool under a grove of trees explained to us in very limited English that motorcycles weren’t allowed on the highway and we’d have to go the backroads. Okay, so 5 or 6.. or 10 hours to Yuanguan. Even though it doubled our travel time, the new route was exactly what we were looking for in Myanmar. With the sun finally peaking out in the afternoon, we gingerly navigated rocky, dirt roads and caught glimpses of locals staring at us with mouths agape when we passed through tiny villages. The day was like something out of a dream. Everywhere we stopped, people were eager to communicate with us however they could. Usually it was pointing at the bike or Tiffanie’s tattoos and giving a thumbs-up. Given the miscalculation of the trip duration, the sun went down a few hours before we arrived at our destination. This was less fun, but we made it to the guesthouse intact. After dropping off our stuff, we motored back into town in search of food and, again with no phrases beyond hello and thank you, managed to find some weird fried egg things at a local bar. It was a rough and rewarding journey. Next up, Bagan.